Kent and Amanda Morales of Novato, Calif. were all smiles June 28 when they arrived at the William R. Pritchard Veterinary Medical Teaching Hospital to bring home "Chief," their border collie. Just under a month ago, the couple had little hope that Chief would survive. For about a week, the dog had shown signs of weakness, lethargy and lack of appetite. One day, he simply could not stand on his own. He had become paralyzed. Then the worst happened: He stopped breathing. The couple rushed him to the local emergency veterinarian, Pet Emergency & Specialty Center of Marin, who stabilized the dog. In the middle of the night on June 3, Chief, paralyzed from the neck down, was brought to the Emergency and Critical Care unit, where veterinary intensive care specialists Dr. Kate Hopper and Dr. Robin McIntyre took charge of his care. Dr. Hopper recalls, "Chief sustained a severe injury to the spinal cord of his neck. We do not know what the cause of this injury was, but we suspect some form of trauma. When he came to the service, we placed him on a mechanical ventilator (respirator) that did all his breathing for him. (The veterinary hospital has several such machines, the same models as are found in human hospitals.) Chief needed intensive nursing and medical care for the weeks following his arrival. He required mechanical ventilation to assist his breathing for three weeks. In that time he received constant physical therapy to try to keep his muscles functional and prevent his joints from stiffening." Chief, unable to eat, was kept nourished with the help of a feeding tube. Veterinary neurologists determined that Chief's spinal cord had been damaged in some way, and that swelling and internal bleeding had taken place. It was touch and go for two of those weeks as Chief's condition reached a plateau. Then, on June 18, Chief showed some signs of voluntary movement. He tried to sit up and made an effort to turn his head. From that day on, Chief made slow and steady progress. The doctors gradually weaned him from the ventilator as his own ability to breathe improved. After 22 days, his doctors judged that he could again breathe on his own. 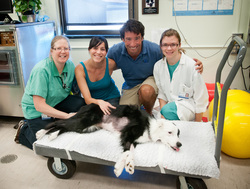 Hopper says, "It was very exciting to take him off the mechanical ventilator on Monday, June 25. Chief continues to improve every day. He can wag his tail and move his legs now. We are hopeful he will completely recover, although it will take many more weeks." Chief met nearly everyone in the hospital during his 25 days in the hospital, and he captured many hearts along the way. Hopper adds,"Chief had his third birthday while he stayed with us, and it was celebrated with cake and lots of playing with toys!" His last day in the hospital, students, resident veterinarians and faculty involved in his case visited Chief to say goodbye and reflect on what they had learned from the unusual case. "Reports of long term ventilation such as this in veterinary medicine are uncommon," Dr. Hopper says, "but we are doing more of it at UC Davis; and by publishing our experiences with these cases, we hope to improve understanding of mechanical ventilation in the veterinary profession." Throughout the tense month, the Morales' commitment never wavered. "Chief's owners visited him every day that he was in hospital, and without their love and dedication his recovery would not have been possible," states Dr. Hopper. The couple learned to move Chief's limbs for him to stretch his muscles and extend his joints. When the Moraleses picked up their pet on the afternoon of June 28, they received further instructions for home care that include intensive physical rehabilitation to help Chief walk again. Although the mystery of Chief's paralysis has not been solved, his recovery to date occurred thanks to the intensive care and long-term aid of the ventilator that assisted him as his body healed. A big part of this story is the assistance we have received from our pet insurance company. Our regular vet, Dr. Bill Estheimer at East San Rafael Vet Clinic recommended that we look into Trupanion Pet Insurance. He told us that Trupanion was the best company he had worked with. This sentiment was echoed at each step of Chief's journey. When we initially submitted the claim to Trupanion, we waited to hear about the limitations to our plan. Instead, they simply told us not to worry, and to do whatever we had to for our dog. They have been wonderful. We have had nearly $40,000 in bills so far, and Trupanion has happily paid 90% as promised. Needless to say, we highly recommend Trupanion to any pet owner. Their dedication has been just as critical to Chief's survival as the skill of his vets. Chief went straight to Sams Clinic in Mill Valley, a renowned veterinary rehabilitation clinic with an amazing phyiscal therapist, Sarah Johnson. He is working at their gym twice a week and rehabbing at home, too. His progress has been amazing. 11/04/12: Chief continues to improve! He is so happy and confident that he can run around and do things that he used to do. He has been going up and down the stairs in our house, albeit not as fast as before. He loves to chase his ball on the field and play with Grandma's puppy, Annie. He's still a little crooked, as the muscles in his neck have healed at different rates on the two sides, but that continues to get better. He is still going to physical therapy twice a week at the Sam's Clinic in Mill Valley with Sarah Johnson. She's been really impressed with his progress, and is concentrating her efforts on his neck. Absolutely amazing! 10/22/15: What an amazing dog! Chief is still very happy and active. He has remained a bit bent to the right, but it doesn't really slow him down, he just makes a lot of right turns! We occasionally go for runs in the hills and play games of fetch, which seemed impossible a few years ago.